The Vikings should dismiss Dead Bears Walking as easily as they swatted aside Dead Bengals Walking at home a couple of weeks ago. Teams with nothing to play for typically play that way. So, with that in mind, do you take, for example, an eight-win Cowboys team and give 2 1/2 points at Philadelphia, where the Eagles have 13 wins and homefield advantage in the NFC locked up? I suppose the Eagles will rest some players. But how much? This is, after all, a team that lost its franchise quarterback three weeks ago. So you also have to consider the momentum factor heading into the playoffs while trying to gauge how the Eagles will treat Sunday’s game. Jacksonville-Tennessee is another intriguing line. Jacksonville, which has 10 wins and a division title, is getting 6 1/2 points at Tennessee, which has eight wins, but has lost three straight and four of six. Yes, Tennessee is playing for its playoff life, but Jacksonville also is coming off a 44-33 loss to the 49ers. The Week 16 picks didn’t prove to be all that tough last week. (Although no money was placed where mouth was). The picks here went 12-4 straight-up and 11-5 against the spread. The Upset Not-So-Special dropped to 3-12 on the season when the Raiders didn’t beat the Eagles. Give me Jags over Titans this week. You’re welcome, Tennessee. I sorta missed on the Patriots. Said they’d win by 20 and they won by 21. This week, as 15 ½-point favorites against the Jets, I’m going to say New England by 28. Believe it or not, the Browns aren’t the biggest underdog on the board. (Hey, baby steps, Cleveland. Baby steps). They’re getting 13 1/2 at Pittsburgh. I’ll say Steelers by 21 as the Brownies match the 2008 Lions as the only 0-16 teams in NFL history. As for the Vikings, well, let’s just say they won’t be giving John Fox the same coaching sendoff that the Bears gave Mike Tice back in 2005. The Vikings should dismiss Dead Bears Walking as easily as they swatted aside Dead Bengals Walking at home a couple of weeks ago. 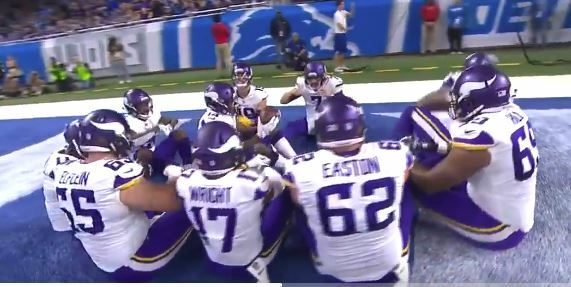 The most likely wrench to be thrown into this scenario would be early sloppiness on the part of the Vikings’ No. 2-ranked run defense. If Jordan Howard, the NFL’s fifth-leading rusher, gets going, the Bears might gain interest in the game. Throw in a few unexpected turnovers and some drive-killing penalties, and the Vikings could lose. But don’t bet on it. I’d give the 12 ½ points. Yeah, the Titans have more to play for. A win and they’re in the playoffs. But they’ve had things to play for the past three weeks and have lost each game. They lost to Arizona and the 49ers. The Jaguars already own a playoff berth and a division title. But they’re also going to want to regain some momentum from giving up 44 points in a loss to the 49ers last week.